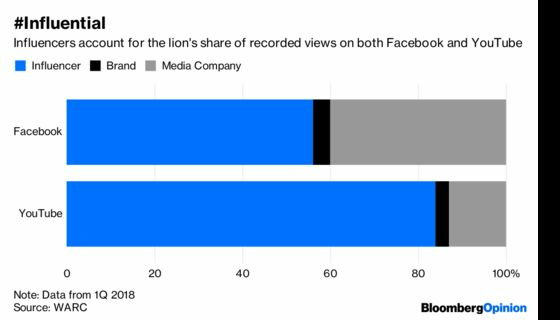 (Bloomberg Opinion) -- Brands spend billions of dollars for social media influencers to promote their products on Instagram. Unfortunately Facebook Inc., the photo-sharing platform’s parent, doesn’t see much of that money. Under pressure from Britain’s Competition and Markets Authority, 16 British celebrities, including Rita Ora and Rosie Huntington-Whiteley, have pledged to clearly label sponsored posts as advertisements. This could ultimately prove a boon to the social media giant. Facebook receives a straightforward fee for each classic ad on its platforms, which also include WhatsApp and Messenger. It also keeps a 30 percent cut of ads displayed alongside news stories in its Instant Articles. But when the likes of Ellie Goulding show off a new pair of sneakers, bottled water or wannabe hot new widget in a picture or post, the tech giant doesn’t receive a penny. The transaction is between the brand and the celebrity, who can do very well by this – Huntington-Whiteley can charge as much as $11,500 a post, according to influencer consultancy Hopper. Spending is huge – the Association of National Advertisers estimated that brands spent $81 billion on influencers across all social media platforms in the U.S. in 2016, and that number will top $100 billion next year. Facebook’s main benefit is that this keeps users in its ecosystem by attracting them with glamorous posts from beautiful(-looking) people, which helps explain why the company has actively courted influencers. 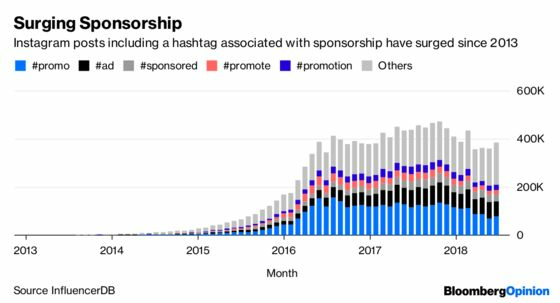 Part of the reason it hasn’t been able to monetize this trend is that it often has the same problem as the consumer: it doesn’t necessarily know if something is sponsored. By forcing influencers to signal such posts, for example with a label “Advertisement Feature,” the CMA is helping the Menlo Park, California-based firm better understand the content. The CMA is following the lead of the Federal Trade Commission, which made a similar move in 2017. The other reason is that Facebook may not want to send celebs fleeing to another social network. As user engagement slackens, Facebook CEO Mark Zuckerberg is under more pressure to boost average revenue per user. While user growth at Instagram has helped offset declines at Facebook, it has also posed a challenge, because its ad offering is, so far, less profitable. That difficulty has been heightened by Instagram Stories, the short, disappearing videos which are a hit among Generation Z audiences, but where ads are less frequent and easier to skip. Being able readily to identify a sponsored post gives Zuckerberg the opportunity to start demanding a cut of the fee that influencers earn, particularly if he can offer brands accompanying granular data on the audiences they’re reaching. That would allow him to boost Instagram’s lagging ARPU. The CMA’s move will also help Alphabet Inc., parent of YouTube, and Snap Inc., but Facebook really stands to benefit the most – the former doesn’t have a revenue problem, and the latter is a much smaller entity. It’s that rare instance where the interests of both Facebook and the regulator align.